The nation’s first response is too often a public safety response. The current state of affairs amounts to a public health crisis, say law enforcement department and policy leaders. The lack of access to mental health care for many communities places an overwhelming burden of mental health crisis management on public safety agencies. 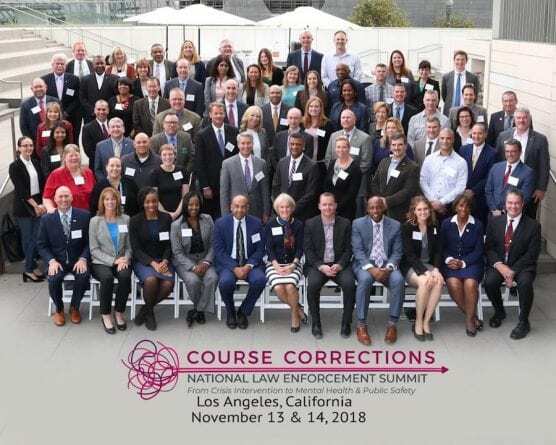 On November 13 and 14, law enforcement leaders across the nation convened in Los Angeles for a first ever Course Corrections Summit to gather and identify priorities for policy and practice reform to improve mental health, reduce incarceration, and increase public safety. Lieutenant John Gannon from the Los Angeles County Sheriff’s Department (LASD) participated in this summit and is named as a participating member. Lieutenant Gannon has been in charge of the LASD Mental Evaluation Team and partly responsible for the team’s growth, innovative programs efforts to promote the LASD co-response, and Veterans Mental Evaluation Team model on a national level. These leaders have just released a priority list for community-based reforms, produced in collaboration with The Equitas Project, a non-profit organization working nationally at the intersection of mental health and criminal justice. “Chiefs, sheriffs, and prosecutors all over the country agree that there is more communities can do to produce better outcomes for more people. Arrest and incarceration should not be the nation’s primary tools for managing mental health. Health care, housing, and education all have bigger roles to play,” explained Vincent Atchity, The Equitas Project’s Executive Director. – Promoting health-based alternatives to arrest, incarceration, and criminal charges for individuals in need of mental health support and care. Read the full report: https://www.equitasproject.org/ccnle-doc-2019/. Take action in support of these priorities: https://www.equitasproject.org/action-urge-your-lawmakers-to-adopt-law-enforcement-course-corrections/. For more information, or to arrange an interview with The Equitas Project or the above-named organizations regarding this update, please contact Gwendolyn West at either 303-789-2664 x210 or gwest@equitasproject.org. Contact Lieutenant John Gannon or Sergeant Vincent Plair at (626) 258-3002 for any LASD Mental Evaluation Team duties. The Equitas Project, an initiative of the David and Laura Merage Foundation, envisions an America rededicated to liberty and justice for all, where there is a commonly held expectation that jails and prisons should not continue to serve as the nation’s warehouses for people with unmet mental health needs. Equitas is a nonpartisan, nonprofit organization which promotes mental health awareness, and which champions laws, policies, and practices that prioritize improved population health outcomes, sensible use of resources, and the decriminalization of mental illness. We are committed to disentangling mental health and criminal justice. To learn more about the Equitas work and mission, please visit www.equitasproject.org, and follow us on Twitter, Facebook, and Instagram @EquitasProject. Email us at info@equitasproject.org. To follow LASD MET, please visit @LasdMET.